The Certified Government Financial Manager or CGFM is the exam used by the Association of Governmental Accountants or AGA to certify professional government financial managers. This exam is designed to provide a set of standards in financial expertise and ethics that all professionals in this field are held to. There is a $125 fee per examination. All three exams are computer administered year-round by AGA through Pearson VUE. Once you have been approved into the CGFM program, you will receive a notification allowing you to proceed with the registration and scheduling of your testing appointment. This can be done online or by phone. You can schedule to take the exams at over 200 locations throughout the U.S., Canada, and some other countries. You should arrive at least 30 minutes early for your exams to ensure that you get checked in and are ready to go. You will be required to show two valid forms of ID. These must contain a signature, and one of them must have a recent photo. Names on your ID must exactly match those on your confirmation letter from AGA. You will not be allowed to bring anything else into the testing center with you. 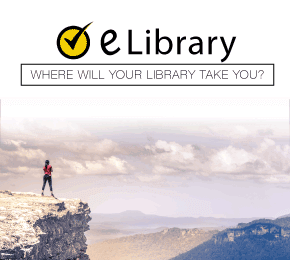 This includes any electronic devices, calculators, food or drinks, and any study materials. The exam is made up of three separate examinations. Each examination has 115 multiple-choice questions are given two hours and 15 minutes to complete. Below you will a brief outline for each with the weight given to each section. You will receive a score report as soon as you complete each exam. These will indicate a pass/fail result. Passing score reports will state “you have passed,” while failing ones will record a scaled score and the performance level for each content area. A score of 500 is needed to pass the exams. With a successful passing of this exam, you will be certified as a Government Financial Manager. This will allow you to stand a head above many in your field, expanding your career opportunities. We know this is important for you, therefore, it is important to us. 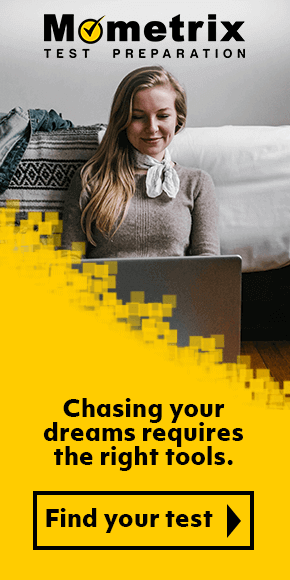 We want to help you succeed. That is why we have prepared a study guide and set of flashcards to assist you in this endeavor. With these tools, you will have all the information necessary to pass each exam as well as plenty of sample questions to test yourself with. These sample questions are structured and formatted in a way that is similar to the actual exam. This will give you an exact idea of what is to be expected during each section. Be sure to make the most of this experience with Mometrix. 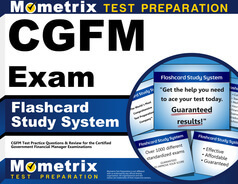 Mometrix Academy is a completely free CGFM test resource provided by Mometrix Test Preparation. If you find benefit from our efforts here, check out our premium quality CGFM Study Guide and CGFM Flash Cards to take your studying to the next level. 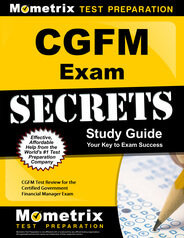 Just click the CGFM study guide link below. Your purchase also helps us make even more great, free test content for test-takers.